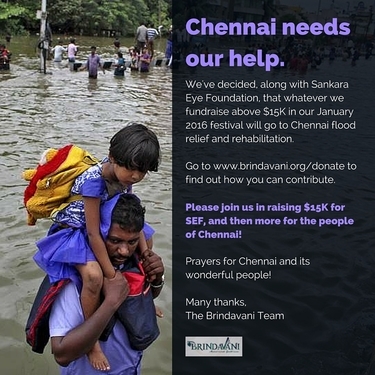 Any funds we raise over $15,000 will go directly to Chennai flood relief and rehabilitation, so please please help us in our endeavor to help both Sankara Eye Foundation and the people of Chennai! For more information about the organization we'll be donating to, Bhumi, click here. Please make checks payable to "Sankara Eye Foundation USA" and mail them to 20 Sage St, Holmdel NJ 07733. Help us reach our fundraising goal of $15,000! We at Brindavani are pleased to announce that we will be supporting the Sankara Eye Foundation at our Third Annual Youth Carnatic Music Festival on January 16th & 17th, 2016! The Sankara Eye Foundation is an organization committed to promoting nation-building projects, through the form of quality eye-care, free-of-cost. Operating and managing 9 hospitals (and counting) across India, they have performed over a million vision-restoring surgeries to date, and they are among the largest providers of eye care throughout the country. The foundation operates under the Sri Kanchi Kamakoti Medical Trust. Hence, proceeds from the event will go directly to the Sankara Eye USA chapter. Vision: To work towards freedom from preventable and curable blindness. Mission: To provide unmatched eye care through a strong service oriented team. The Need: 1/4th of the world’s population is in India and 2 million new cases of cataract are added every year. The incident which is rapidly on the rise, is due to non-availability & non-affordability of quality eye care in Rural India. In this scenario, Sankara’s comprehensive community eye care initiative gains greater significance. Sankara’s goal is to eliminate needless blindness. Vision 20/20 by 2020: To create replicable and sustainable models of Sankara Eye Hospital and establish one in every State of India with the ultimate objective of achieving perfect vision for all by the year 2020. For more information, please visit: www.giftofvision.org (Sankara Eye Foundation, USA). Let us know how much you've donated so we can keep track of our fundraising efforts!